Considering the anachronistic 17th century ‘Diogenes’ painting by Caesar van Everdingen, exhibited on one of the walls of the Galerij Prins Willem V, suddenly in the head of this nowadays painter the idea came on to make a new 21st century version of this classic story, which of course should be taking place in our own times. 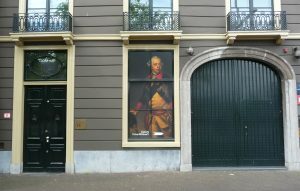 And what background would be more suitable than the Prins Willem V Galerij itself with the original Van Everdingen painting hanging dominantly in sight? Being always the improvisational and preliminary stage of any new Contefeyter painting, a fresh optional scene was born, at least in the imaginative head of this painter. That is where it always starts. At this point, however, still far away from an actual painting. From that rather abstract and premature moment on it always appears to be up to initiating persuasive talks and supportive e-mails to convince the various counterparts on the other side, in this case being the museum’s directorate, to make them become just as excited about something which at this point is no more than a verbally expressed idea. Fortunately, those efforts finally turned out to be successful. 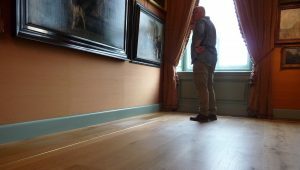 Thanks to the generous hospitality and co-operation of the Mauritshuis museum this idea could become reality. Step by step a new Conterfeyter painting appeared to have been born. But what would this new painting look loke? Of course, the imagery of the proposed scene is very Diogenes like, depicting the stubborn non-conformist philosopher, while he appears to be causing quite a stir in this prestigious both eighteenth as well as twentyfirst century gallery space. Especially the faithful museum guard can’t believe his eyes. The notorious Diogenes unexpectedly shows up, sitting on the gallery floor, with his back to the wall just below some of the famous paintings and his (at this photographic stage still invisible) faithful dog laying between his legs, even brutally pushing aside a concerned and helpful visitor, while he obsquitessively seems to be focussing on the light beam of his rather huge, camping sized, torch light aimed on the floor in front of him. This ‘in situ’ improvised scene combines two of the most typical and often painted scenes of the Diogenes myth, depicting the philisopher with an artificial and contemporary light source in search of a true and honest man as well as a reminiscence of the encounter with Alexander the Great, being stubbornly far more concerned about the endangered glowing light on his face than anything else. 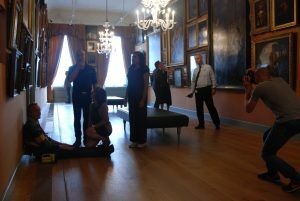 With the formal permission of the directorate of the Mauritshuis officially granted, the next step would be photographing the different characters within the beautiful as well as very inspiring stage of the Galerij Prins Willem V. Thanks to the willing courtesy and warm co-operation of everyone within the museum involved, this photo shoot finally could take place. All posing characters in the painting are functioning, although most of them on the background, within different sections of the museum. Such as the technical supervisor for the presentation of the art works, the senior volunteer in the musem shop, the head of collections, the head of the educational program, the director of the museum, the head of security, the senior restorator as well as the person responsible for the adult education. Everyone posed with admirable diligence and patience in front of the painter’s camera. Step by step, with the collected photo files as raw material, the first stage of the painting to be appears to have been given shape.